Heroes of Hellas is rated 4.2 out of 5 by 22. Rated 5 out of 5 by Bumbles2 from A Match 3 worth buying !!! I enjoyed playing this M3 and so did my G'kids. It was good quality time and we had fun playing. There are some challenging spots in this game but all are very doable Music and graphics are really good and now I think we're going to be buying the next in the series !!! You won't be disappointed with this one...guaranteed !!! Enjoy all !!! Rated 5 out of 5 by melissa845 from Liked all the games in the Heroes Series All the games in the Heroes series are fun, challenging and interesting. I wish there were more games in the Hero Series. Challenging but not too hard for those with at least some intermediate skills or those who find they immediately love Matching Three puzzle type games. I played these games as some of my first match three games and still play them again occasionally. Rated 5 out of 5 by arnold1049 from CHAIN-STYLE MATCH 3 GAME The BF support staff found this game for me after I played my first chain-style Match 3 game and fell in love with the format. 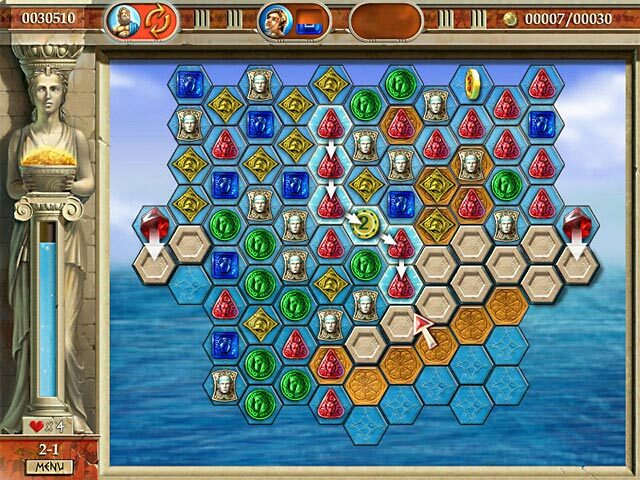 In this type of Match 3, instead of switching tiles to make a match, the matching tiles are highlighted by the cursor in any order to make a match. The chain of matching tiles can go in any direction, making curves and circles and other shapes. More points are earned for making longer matches, just like in the standard version of Match 3. There are 3 levels of difficulty; Casual, Normal and Expert. These levels cannot be changed once a game has begun. I started out In the Normal mode but when I reached level 4 and could not complete the grid in the allotted time, even after many attempts, I start ed a new game (I used a different Player name) and chose the Casual level of difficulty. I'm not sure, but I think the only difference among the difficulty modes is the amount of time allowed to complete the grid. Trophies are awarded for various completed actions, one of which is to complete the grids without using any of the available power-ups. The additional time allowed in the Casual mode made this an attainable objective. Under the Normal mode, even with using the power-ups as soon as they became available, I still could not beat the clock. This is extremely frustrating to me and if there had not been a choice for more time or an untimed mode, I would have quit the game and given it an extremely bad review. Now I can look forward to playing the other games in this series without frustration. 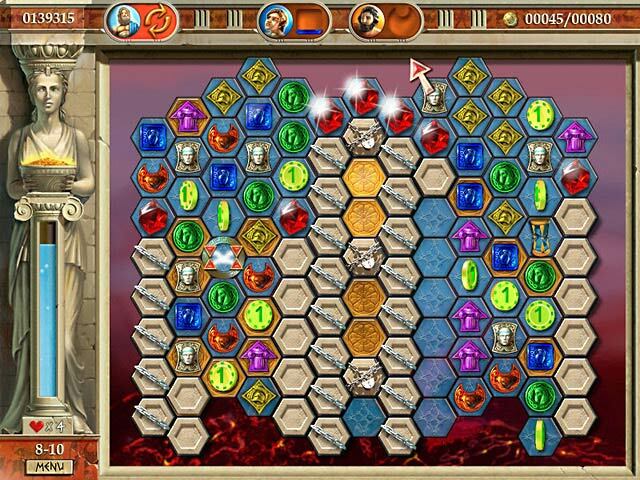 Power-ups are in the form of various Greek gods and are activated by matching "X" number of tiles of a certain color. Progress through the game consists of completing one level at a time, at the end of which a new god is made available for use as a power-up. Each god accomplishes a different task, such as eliminating one tile, reshuffling the grid, etc. Zeus, the kind of the gods, is available immediately when the game starts and allows the grid to be reshuffled. This power-up recharges through the passage of time, while the other gods have to be "charged" by clearing the correct number of colored tiles associated with that god. In addition to trophies, coins won during play can be used to build a temple. 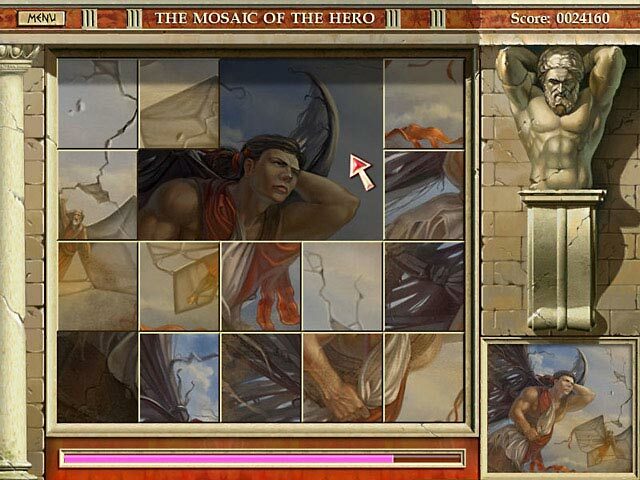 At the end of each level (which consists of numerous grids to be played) when a new god is unlocked, a jigsaw puzzle can be played where tiles must be swapped to create a picture that can then be used as a screensaver. This is a great game using the unique chain-style of play to create matches. Rated 5 out of 5 by reidar13 from Fun Hidden Object Game I like the Hidden Object Game. 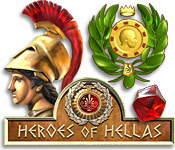 Rated 5 out of 5 by princess282828 from heros of hellas I own hellas 2-3. a must have, 3 have found to be the best of all. wish there were more like #3, played twice all the way though. Rated 5 out of 5 by howelld13 from Great! I started off backwards purchasing nos. 3 and 2 and loved them. Bought this one and while lacking elements of the first two, it is extremely hard and I love it. Still am stuck on a level but will continue trying. Buy it if you love a challange. Rated 5 out of 5 by anniecamp from fantastic game can not stop playing it.!!!!!!!!!!! Only one thing wrong, not enough time in some of matches, and once you have finished the game you should be able to go back and choose a level to play again. Rated 5 out of 5 by kathiebee from As Good As The Others I, like some others, played 2 and 3 first, so was reluctant to get number one. Then I decided to use a game credit on it, and I was not disappointed. Whilst it is slightly different in some respects (perhaps simpler in some ways), this does not diminish the enjoyment of the game. Level of challenge to make it interesting, but not too difficult. I usually don't like timers, but I did not have a problem with this one. I also loved the storylines of the Heroes, particularly thrilled with the very last one! I recommend this game as much as the others. Rated 5 out of 5 by MEnr56 from PLAYED in TIMED mode and BEAT IT To be honest (after having played the other 2 sequels), I don't recall if this game has an UNtimed mode or not but I decided to purchase this game (despite having many timed M3 games only half played because I couldn't beat the clock) and I was able to completely finish the game. There were some levels that I had to replay several times while accomplishing the feat with only a second or 2 left on the clock but for whatever reason, I actually enjoyed the challenge of this game and didn't mind too much in having to replay levels. I believe it was because of the fact that the timer does not act like a flood -- draining within seconds -- but acts like a slow leak -- draining just enough to keep you on your toes. Rated 5 out of 5 by Imppity from Finally, a challenge! ...and it is! I started on the Normal setting and by the mid-levels I was always coming *right* down to the wire on the timer. I have other Match 3s that I enjoy more leisurely, but this one definitely tests your brain-hand-eye coordination. :-) As an added bonus, the game doesn't condescend to you with poorly acted character dialogue, but states the premise quickly in text and moves on. The Mythological theme, for those of us into these things makes a great backdrop, and it's obvious the designer had some affection for, and knowledge of, the topic. It's great that somehow a great game didn't get lost in that zeal, but the mix was just right. One could *easily* enjoy the game without such interest. I hope the sequels are as balanced and as challenging.